Yes, it's true. The Bill Bair's roadster that friends and I call "Daytons", is for sale. I'm posting this exactly two years from the day when I saw this car for the first time and purchased out of that small Long Beach garage. Ahhh... I can remember that day very well. My hot rodding life has changes immensely by owning this car. 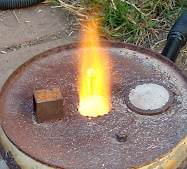 It's been the topic of more then a few blog posts here, which has kept you the reader, and me, entertained. It's coolness has helped me make many new friends, in person & online. And it is now featured in two popular magazines, Rod & Custom's Little Pages, and now Rolls & Pleats. 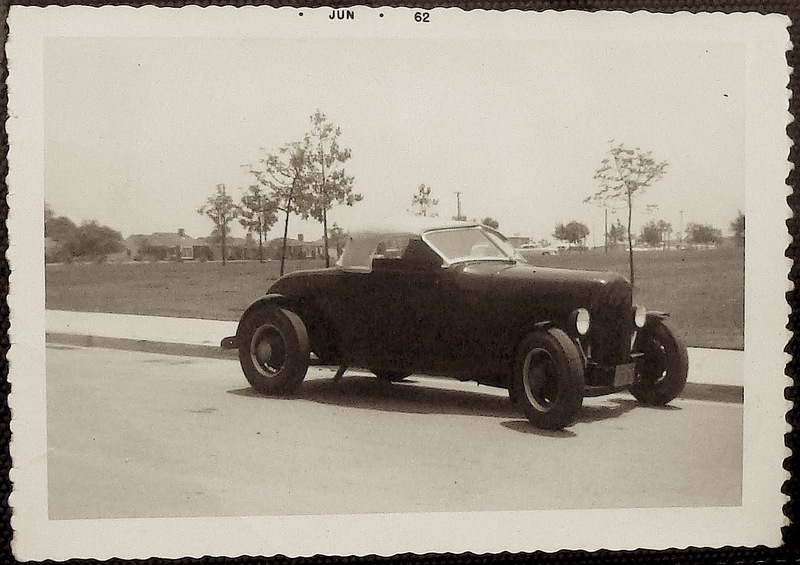 Plus, I've learned a lot about hot rods simply by owning this vintage roadster for the short time. New techniques & ideas, some of which I am already using on my current roadster built, the '27 T.
I am a lucky persons, I got to reintroduced Bill Bair's car back into the world. I only hope Bill would have liked what I had done with it. People really love to see this car, it craves attention. The new owner will get the whole package! This car is more then meets the eye --you can change it's look to suit your pleasure. It has a removable canvas top, a 3-piece hood, extra wheels with wide tires. 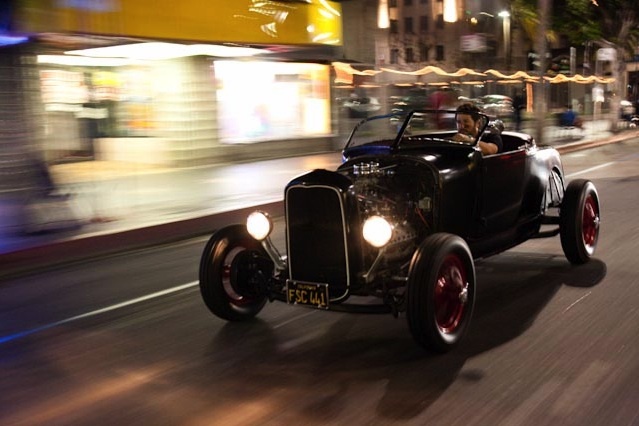 Everything you want, and more on a hot rod roadster! You can plainly see it's a Model A on a original 32 frame, but under that bonnet beat the heart of a winner. The Ford flathead engine is all vintage muscle. And just like the body it is custom everything! A car with a long history and comes includes an album with many old pictures. The oldest dated photo is 1959, and some undated are older. It is fun to drive, starts easily, shift well, stops well, and it gets a lot of attention. The cosmetic condition of the car is less then great, the paint is fifty years old and has many scratches & chips. All the chrome has aged, as has the rubber, and everything else in fact. This is an untouched vintage hot rod, and it looks every bit the part. Born right here in So. Cal. with hot rod history running through every part. The asking price was $35,000. To learn more about this car, I've updated the roadster's page with all the statistics and new information. Please click the picture on the left side of the page "Daytons" or click here. If you have any questions or comments, would like to see the car in person, or to make an offer click this link to email me. The second-annual (reborn) Long Beach Motorama seemed to be an improvement over last year's. Although I thought last year it was pretty great. The attendance was larger, the displays bigger, and the cars even glossier! Now I can't show you every car, so I'll show you some of my best shots. I'm not really a customs-guy, but nobody can say the don't like any of these cars. I mean each one was truly rolling art work. The king of the hot rods itself, the Barris built 'Emperor'. The original owner was Charles Kirkorian, today by Blackie Gejian. Once winning America's Most Beautiful Roadster, and one of my personal favorites. 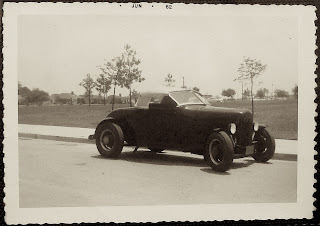 Gary & Karen Schroeder's 1932 roadster, one of my new favorite cars. Gary has used a lot of components his company makes, like front & rear torsion-bar suspension, and a sprint car steering box. The car is bristling with one-off machined parts as well as many vintage items, as seen on the dash for instance. A car that piqued my interest was this lakester built from the wing-tip fuel nacelle of a Lockheed Constellation. The inner frame is steel with a aluminum skin, the 700+ gallon tank was found in Canada and was used for water storage before it was a car. The car is registered for street driving as a 1917 Crow brand automobile, but has nothing really to do with a Crow except to used the V.I.N. The lakester seats two in tandem, and used many aircraft parts as well as numerous custom parts like the 20" wheels. I'm just in awe of it all. Spectators can get right up and literally smell the history! Outside, it's one whole other show! These cars are all about what So. Cal. is --only the coolest rides!